There are, honestly, not many Halloween decoration that I would consider displaying in my home. I did when my daughter was younger but those days have passed now. 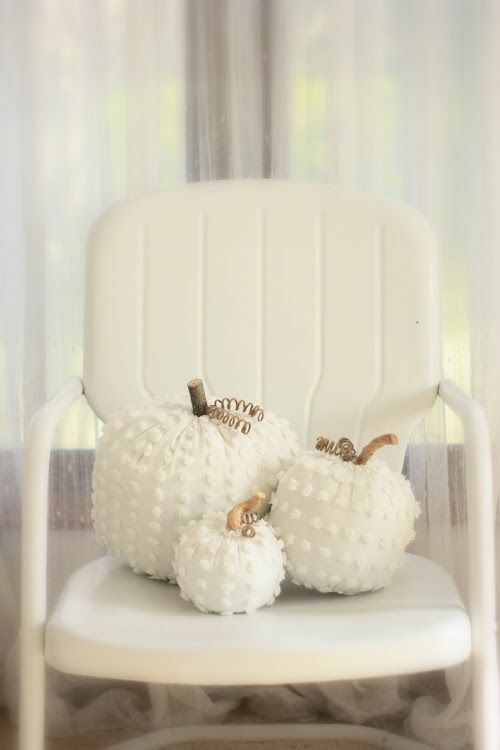 When I saw this lovely Chenille pumpkin set on Erin Art and Gardens I was impressed. This was something that I would display with pride. Erin found hers at a flea market but they would be very easy to do. Coil your wire into a spiral and spray it with gold paint. Let it sit aside to dry. Cut a circle from the chenille bedspread that is large enough to wrap the pumpkin smoothly with not too much extra material. Repeat for each of the pumpkins. I’d do them in three sizes. Take your white thread and needle and stitch it loosely through the outside of the chenille circle. Bring the circle up to the top of the pumpkin and draw it tightly so that it gathers around the top and around the stem. Stitch it in place firmly. Many thanks to Erin of Erin’s Art and Garden and her flea market find for sharing this project! Be sure to visit her site. She also shows the design in orange material. These are adorable, going to create with my grand kids,thanks so…much for sharing!